The Renovation loans are options available to not only finance the purchase of your home, but also finance eligible renovation or rehab costs into one single mortgage loan. The purchase of a house that needs repair is often a catch-22 situation, because the bank won’t lend the money to buy the house until the repairs are complete, and the repairs can’t be done until the house has been purchased. 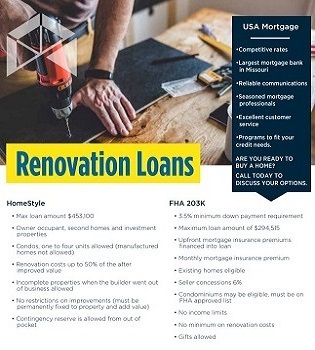 An FHA 203K Renovation Loan or the Fannie Mae Home-Style Renovation Loan are options used to fix-up, repair, or renovate homes. The Renovation Loan allows access to a government-backed loan program for needed funds and Home-Style Conventional renovation program is done by private investors and follows conventional guidelines. Think of these as a one-time close construction loans. At closing, the seller receives their money, and the rest is put into escrow for the buyer to use for rehabbing the property. Each program has its respective advantages, and either could be right for you. Clients looking to complete or remodel a project but don’t have enough money after the down-payment. Found a house in excellent location and price but needs some TLC. It doesn’t pass the lender appraisal, and the sellers aren’t going to fix anything. Need new energy efficient and new appliances. If you have found a home that has the perfect location for your family but isn’t quite up to snuff, a Renovation Loan could be perfect for you. Add a bedroom or bathroom, finish the basement, remodel the kitchen – whatever you need to do to make the perfect location also the perfect home, a Renovation Loan allows homeowners the opportunity to start fresh with a pre-existing home. Loans are done in the house, therefore, make it faster and easier. Extensive experience in doing these loans. Offers very competitive rates and fees. Fast turn times in approval and closing.